The design for Bloom was inspired by photographs of the cacti which the artist used to compose this lush explosion of blooms. 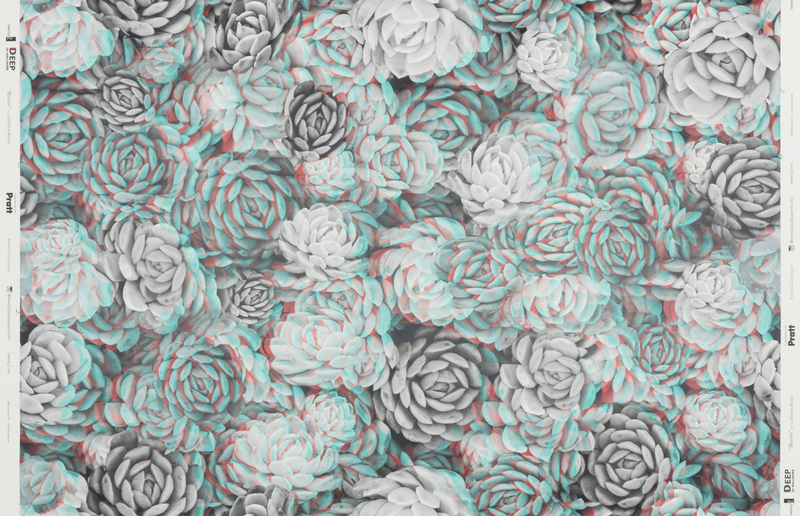 Bloom is part of a collection of 3D or anaglyph wallpapers produced as a collaboration between Connecticut wallpaper company twenty2 and Pratt Institute. While many people think of 3D or anaglyph imagery as a recent phenomenon the technology was actually developed in the 1850s, and the first 3D motion picture was projected in 1893. Anaglyphs have been used in a variety of media including comic books, magazine ads and newspapers. The principle behind the stereo view or anaglyph 3D is the printing of two identical images, one in red, one in blue, slightly off-register to make up the stereo view. When viewed through the red and blue lenses in the anaglyph glasses only one of the two images is seen by each eye. The brain then fuses these images into the perception of a three-dimensional composition. This collection is the first commercially produced 3D or anaglyph wallpaper. While this design may seem to be a mere novelty the design is attractive when viewed both with and without the 3D glasses, though viewing the paper through the 3D glasses gives the wallpaper a whole new dimension. Twenty2 was founded by Kyra and Robertson Hartnett in Brooklyn, New York in 2003. Their designs are predominantly geometric, with a few florals in the mix, all rendered with a contemporary styling. While working on their first collection of wallpaper they visited the Cooper Hewitt for inspiration by looking through the wallpaper slide carousels. For the record, I have to state this low tech process of viewing images has been updated with a searchable database containing hi-res images. The studio has since moved to Litchfield, CT where they produce their digital-printed wallpapers. This wallpaper can be viewed in the Immersion Room.